After a good cleaning service, the house looks so clean that it becomes unexplainable how it gets progressively disorganized in no time. But our experts believe that daily keeping projects does not have to be a difficult labor, Instead, you can make it easier completing simple tasks, one at a time. Having a plan helps. 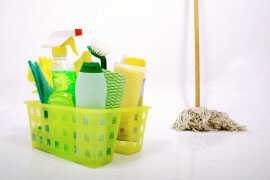 many homes have chores schedules for every member of the household, but even if your are alone, we can recommend a technique from our Spring Breeze staff: when they enter a customer’s home to clean, they always start with a specific area, dividing the room in sections to stay organized and avoid leaving spots unattended. Take 15-20 minutes a day to take care one thing. For example, focus on one room start one side and go all the way to the opposite, so you have some sort of plan and organize everything faster. Do the hardest first. Even if you are cleaning the kitchen or want to arrange the closet, the trick is taking everything out first, so cleaning the space is faster and easier. Put all things away: hang up clothes, put away dishes, clear your counter. Putting all items away makes the house look neat even though you have not cleaned yet. Then you can decide what you are going to put back in or tossing away. Don’t forget the bathrooms. Since the dirty towels and objects on the counter are items you can either take care regularly or wait for a throughout service with us to get clean, all you need to do is have a scrub the bathroom with a disinfectant towel.